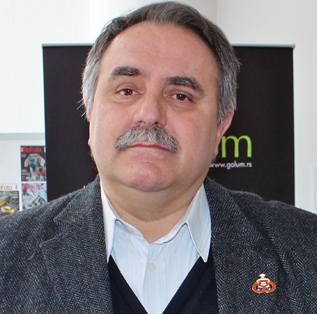 Dimitrje Vujadinovic is the co-founder and director of Balkankult foundation Balkankult Foundation Intereg and memeber of the Journalist Independent Association of Serbia and International Federation of Journalists IFJ situated in Brussel. He has worked as a researcher at the Institute for Cultural Reserch of Serbia. He was Special Adviser of the Minister for Curlute of Serbina in 2001..Coordinator and author of the international project Bread and Culture – The World`s Heritage, since 1998. He organized the following exhibitions: Ritual and Holiday Bread; Bread on the Medieval Frescos; Posters Ulm Bread Museum; Ex-libris - Bread; Water Mills; Bread in Egypt; Wind Mills; Civilisation of Bread and Beer and the International Ex-libris competition: Bread - Cultural Heritage. Author of more than 60 papers published in collections and periodicals of sociology, culture and ecology. Wrote many articles published in daily and weekly newspapers.